Scale Weighing Systems SS-20 Series Bench Scales have a weighing platforms 20" x 20" and five weighing capacities with 5000d resolution throughout the line, 25 lb, 50 lb, 100 lb, 250 lb & 400 lb are available. 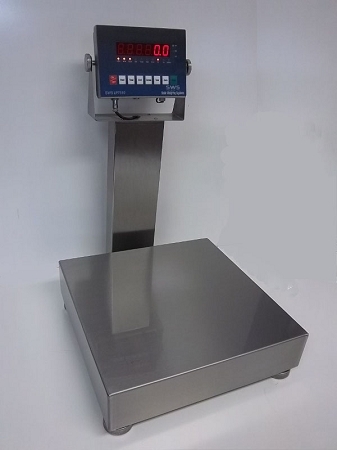 The SWS SS Series digital electronic bench scales weigh in either pounds (lbs) or kilograms (kg) weigh modes plus additional functions include Hold(for Animal Weighing) , Check-Weighing and Totalization. Ideal for food preparation, food processing plants, agricultural facilities, and more, SWS-7611SS scales feature IP65 rated wash down Base and Indicator with a large stainless steel weighing platform. Color indicators for Under, Ok, and Over limits make check weighing fast and easy, and a brilliant LED Display makes reading the weight a snap. The SWS SS Series Bench Scales are AC/DC, and the built in rechargeable battery last ( Aprox. 100 hrs ). The 7611SS Series also features an easy to use Over / Under indication and 304 Stainless Steel weighing pan. The tubular 304 Stainless Steel constructed frame is built and designed to offer a Lifetime of accurate weighing results. The Scale Weighing Systems SS Series Bench Scale is your ideal, economical weighing solution for applications such as Portion Control, Straight Weighing or Over / Under weighing.